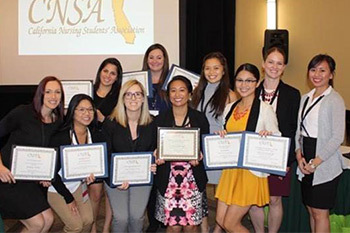 Additionally, scholarship awards were presented to two National University nursing students: Ashley Weber, the outgoing National University CNSA chapter president, and Jessica Gonzalez. Two other National University students who serve on the CNSA state board, Keena Mapanao and Jamie Kuhn, received honorable mention. The National University Chapter also won the CNSA costume and dance contest for the second year in a row. As the outgoing “Breakthrough to Nursing” Director, Ms. Mapanao was recognized for helping nursing students, mentoring prospective nurses, and providing outreach to high school students through the CNSA’s Future Nurses High School Club project. Ms. Kuhn was recognized for her contributions to “Stand Down for Veterans,” an event sponsored by Veterans Village of San Diego to serve homeless veterans. Ms. Kuhn recruited nursing students to help administer aid and deliver much-needed goods. Ms. Gonzalez was nominated for her scholarship by National University faculty for exhibiting exceptional caring and compassionate behavior during nursing clinicals; and Ms. Weber received her scholarship for dedication to CNSA and nursing leadership.